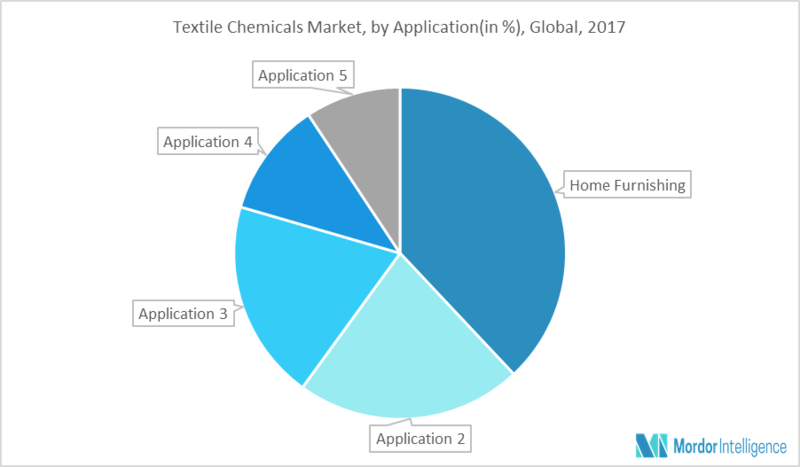 The global textile chemicals market is expected to witness a CAGR of 3.82% during the forecast period. Textile chemicals include a vast line of products ranging from highly specialized chemicals, such as flame-retardants, pH regulators to relatively simple commodity chemicals, like bleaches. They are an integral part of various commercial and industrial sectors, where any sort of fabric is used in operation. Apparel is one of the oldest and largest export industries in the world. It is also one of the fastest growing global industries due to the reason, most of the developing nations manufactures for the international textile and apparel market. Apparel production is a springboard for national development. China, India, Bangladesh, Turkey, Vietnam etc., are some of the major targeting areas for apparels. China has always been the largest consumer, as well as supplier for textile chemicals. It is expected to remain the single-largest and fastest-growing market for coming ten years, at least. Indian industries have witnessed significant growth owing to government concessions to small-sized establishments and adoption of better technologies. The connection between manufacturers and end-users created by traders from Hong Kong, South Korea and Taiwan is a unique trait of global textile and apparel sector. Increasing construction market across the globe primarily in countries, such as China, and India is boosting the demand for home furnishing applications. Bed sheets, towels, upholstery, curtains, rugs, carpets, table linen, window treatments etc. Shifting trend towards soft furnishings in homes is likely to further boost the fabric softeners in the home furnishing applications during the forecast period. In terms of consumption in 2017, Asia-Pacific accounts for more than 45% of the market followed by North America and Europe. The extensive demand for textiles in countries, such as India and China, from the apparels and the home furnishing sectors have made Asia-Pacific an area of immense potential and opportunities. However, the increasing labor costs in this region have considerably hindered the growth of this market. Additionally, Asia-Pacific is a largest exporter of textile chemicals to Europe. Major Players: Archoma, Buckman Labs. Inc., Dow Chemical Company, Covestro, Huntsman Corp. and Lubrizol Corp., amongst others. 9.3 Air Products & Chemicals Inc.
9.10 Dainichizeika Color & Chemicals Mfg. Co. Ltd.
9.12 Formosa Organic Chemical Industry Co. Ltd.
9.15 KC Chemical (M) Sdn. Bhd.